I wanted to break these slightly apocalyptic (but real) posts about the future of our planet and give you some practical cleaning tips that you can start using today. So while I was cleaning I thought, maybe this is something you all would be interested in. Maybe it will give you some ideas on how to reduce waste and have less toxic chemicals in your home. And this is not one of those perfect “zero waste” posts where I would tell you I never use any plastic and clean only with coconut shell and homemade soap. I wish I would be on that level but I´m not. My home is not always clean and I have a puppy that thinks she is a beaver. But this is my low waste, non-toxic, simple and honest cleaning. But what´s wrong with traditional cleaning products? a lot of commercial cleaning products are full of toxic chemicals that are harmful to you, your kids and your pets. very polluting to our environment (when we flush them down the drain) or spray them around. usually packed in plastic, creating a lot of waste. take too much of your money. and half of them are useless or have the same ingredients and created just to convince you to buy, buy, buy. you should also have them locked up because they are so dangerous if your kids or pets ingest them by accident. But then people wipe them all over their kitchen table and floor, which both pets and kids lick. with buying them we support companies that don´t give a crap about us, people, animals or environment. So instead of all that we can use natural, simple home-made or eco cleaning products that are not harmful to us or the environment. And of course a lot cheaper. I checked all the ingredients of the products in the post with EWG page and they are not (that) harmful to the environment or us, but I would still like to use more natural DIY products. the king of the cleaning cabinet. Some people are avoiding white vinegar because of the smell and I totally understand them. We are (or were) all just used to that artificial synthetic fragrance in standard cleaning products and we connect that with cleanliness. When you start using white vinegar, you will slowly replace that artificial smell for vinegar and connect it with cleaning. And I promise the smell goes away really fast and it also takes any odours with it. After a while, it will be something as normal as that artificial lemon smell was. Vinegar also kills bacteria just like bleach but isn’t harmful to humans, pets or our earth. It´s safe to ingest that tells us enough. It´s also very cheap and can be usually found also in glass bottles. if not just buy the biggest container you can find (3-5l). for cleaning any surfaces from the bathroom, toilet, windows, wooden floor, carpets, furniture, kitchen counters, fridge, oven, …: mix 1/3 of white vinegar with 2/3 of water and add a few drops of essential oil*. I use an old air-freshener spray, from the days I still thought they are a good thing to have. We are all learning here. I should probably move it into a glass bottle. You can even soak some lemon or orange peels in vinegar for a few days to add that citrusy smell. Or add some natural essential oil. *please check which essential oils are safe if you have a dog or a cat although they are diluted. or baking soda (aka soda bikarbona) is the queen if you need heavy duty scrubbing or drain unclogging. I bought 3 bags almost 3 years ago for about 1-2 €. You can easily get it in a 1kg cardboard box or even buy it bulk. Bicarbonate soda has so many uses, from cooking, drinking it for your stomach problems, DIY toothpaste, or as deodorant (what I used for a long time), allergies, peeling, washing your hair, to treat acne … but let´s get back to cleaning. 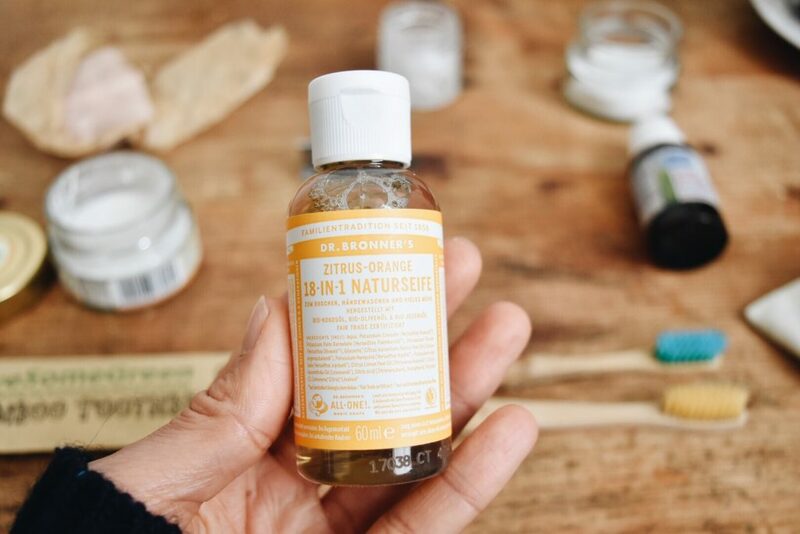 like Dr.Bronner´s 18 in 1 castile soapor similar eco ones, can be used to clean everything from dishes, clothes and everything else in your home. Check all that it can do on their page, but here is a photo of the mini travel size. But if you don´t have a bulk option, they will, unfortunately, come in plastic. I use bicarbonate soda to clean my bathroom (sink, tiles, shower, toilet, shower heads, faucets ) anything that has a limescale buildup, that is the result of impurities and high mineral content in hard water. Especially here in the mountains. I just sprinkle some soda on whatever I want to clean and use a brush, old sponge, or old towel to rub it and polish and then rinse (you know how cleaning goes). To cleaning my toilet I sprinkle some bicarbonate soda into my toilet and leave it for around 15 min and clean it with my (still old plastic) toilet brush. But if you are buying a new one, you can get a wooden toilet brush right here. For cleaning drains I use vinegar and b.soda: Pour a half cup of baking soda down the drain, then a cup of white vinegar. Boil a kettle of water. Pour the boiling water down the drain (if you have plastic pipes use warm water). I read somewhere that you shouldn´t mix them together because they cancel each other out, but this works great for me. Maybe because they start to fizz and push everything down or up. Old toothbrushes I´ve been buying bamboo toothbrushes for a while now and after they retire, they get to clean hard to reach spots in my shower or grout between tiles. I clean that with b.soda. Switching to low waste has really simplified my routines, plus my kitchen looks a lot nicer without all that plastic products. For scrubbing my oven, fridge, sink, tiles wooden chopping boards, …I use b.soda and for countertops, table, cupboards I use vinegar mix. Bottle Brush: You’ve got to get the bottom and curves of your water bottles and thermos, this guy does the trick. Unfortunately, this one has plastic bristles. I found some options here, and here. Pot Brush: Made of wood, metal and I think plastic bristles. I’ve had this one for a long time and it’s still in ok shape to be used for a while. After I will buy one with agave or other bristles that can be composted when it’s scrubbing life is over. An eco-friendly alternative here, here, here, a replacement brush, and more eco-friendly cleaning products right here. Dish sponges and alternatives: I also started making my DIY rope sponge (something like this) for cleaning the dishes and I will keep you updated on how that worked out. Another alternative to conventional sponge is also washable cotton sponge like this one. Dishwashing liquid: I used to wash dishes with bicarbonate soda + water and switched to washing liquid with the least plastic I could find here – Frosch. I mixed 1/3 of the liquid with 2/3 of water in an old glass bottle with a spray top from an old cleaning product. This would last a really long time. And since we have a dishwasher now I think I will just skip using it or use hand soap in the kitchen. I saw that it´s also possible to get dish soap bar, that is something I would like to find. If you have a bulk shop or a standard shop that does refills, I´m very jealous. I know that the Ecover brand has a refill system and now Planet pure in some DM shops. Zero waste shops in Graz and Vienna, Berlin (speaking for ZW I visited) definitely offer them. Here is a list of zero waste shops in Slovenia, Austria, Germany, Switzerland and around the world. Dishwasher tabs: we decided to buy a table-dishwasher (half as big as a normal one) to save us time, energy, water, hot water….I bought the most eco tabs I could find here (small mountain town) and they are from DM. They are wrapped in water-soluble foil. And since my machine is smaller I just break them in half. The EcoLabel on it means that the product has lower environmental impacts than comparable ones. The aim of the EU Ecolabel is to enable consumers to identify more environmentally friendly and healthier products and services. But that does not mean they are the best option on the market. I might try some other eco tabs or try to DIY some from washing soda+citric acid (or something similar). Will let you know how it goes. You can also buy those ingredients and (also refill) them at Eco Green Apple. I did try washing dishes in my machine with only b.soda and it worked well. I will keep testing and give you a DIY update. Compostable and washable Sponge cloth made from renewable raw materials. Both the cloth and packaging are 100% compostable but in our home compost. And that might be a problem if your local compost facility doesn´t except them. They are made from 70% cellulose and 30% cotton so the will eventually decompose even if they end up in a landfill. But that is not the best solution. The plus side is that this cloth can be washed in the washing machine around 300 times, so it will last a long time. I also cut mine in half so the packaging lasts even longer. They are available here(I think mine was from DM). But as soon as use up this batch (probably in 1 year or something haha) I will try skipping them and just use a old cotton cloth. Tea towels If you need to buy new ones try to find organic cotton, linen, hemp. 2nd hand shops might have them as well. You can also cut up some old sheet and make tea towels. I cut up some old couch throw and haven´t even sewed the edges, but they are still holding on great. Washing detergent I am switching between Frosh liquid, Frosch powder and right now I have Planet Pure one that smells amazing (lavender for island girl) and the packaging is made from bio plastic (sugar cane). And I just saw an Insta post from @dariadaria that DM already offers Planet Pure refills in some of their shops. I know some zero-wasters are using soap nuts: soap nuts are grown and imported from in India. the massive demand of these made the price jump up for locals and they are now forced to buy harmful detergents. So the same rule as for everything else we buy – buy locally produced and grown products. Softener: I don´t use it at all, even my mom stopped using it 20 years ago. You can add some white vinegar into your washing machine to soften and whiten your clothes. I air dry all my clothes. I also wash any polyester clothes in my Guppyfriend (available here and here or here). Hoover/Vacuum cleaner: yes, we have one. It´s small and strong enough to clean the carpets. It´s energy efficient and doesn´t use bags. So after vacuuming I simply empty it into the trash. Cleaning carpets: you can refreshen your carpet with sprinkling some b.soda (add essential oil if you want or don´t have animals) on your carpet, leave it for a while and then vacuum it. For any stains just use b.soda and water or all-purpose cleaner aka vinegar. Wooden furniture polish: Since I have a lot of old/vintage wooden furniture from our grandparents, I sometimes polish it with some olive oil. Mix equal parts of vinegar and olive oil and apply it with a cloth. It also works to remove white rings left by wet glasses on wood furniture. Don´t use vinegar or stone, granite, marble. Disinfectant spray: If you need something that is more heavy duty than white vinegar (which kills around 80% of bacteria), you can use vodka if you have it or pure alcohol (that will kill probably all of them). Again you can add some essential oils. Mould can be cleaned with vinegar. So if that is a problem in your home (like in mine) spray some vinegar on the wall and use a brush to scrub it. Leave it to dry and repeat if necessary. This should also stop the mould from coming back. What to do with toxic cleaners you don´t want to use anymore? When replacing your cleaning products, don’t just throw the old ones in the trash or pour them down the drain or toilet. If they’re too toxic for your home, they won’t be good for the drain or the landfill either. Many communities hold toxics & electronics recycling days and will take all of these off your hands. Throwing chemicals in the trash or down the drain means they might end up back in your water supply and come back to haunt you. Thank you. Don´t know how I manage to make this post so long since I basically I use soda, white vinegar, old clothes for everything in our apartment. But as you can see I´m far from zero waste or perfect. I just wanted to show you what I use and what is easily available to me. And now after writing this and diving into this topic, I definitely want to try to DIY some things. But If I would try to make everything from scratch I would drive myself crazy. But if that is your hobby and something you enjoy doing, go for it. I think the goal is to do our best to minimize our waste, toxic chemicals in our home and our impact on the environment. Take care of our health and make things simple, quick and enjoyable for us. So use whatever is available to you where you live and don´t put to much pressure on yourself. Using less plastic and switching to eco products it takes time, especially when so many brands are greenwashing and making us believe we are buying truly eco products from them. With using only vinegar, b.soda for almost everything made this transfer and cleaning so much easier, healthier and cheaper. I definitely didn´t vacuum at all before taking this photo (5 seconds ago). It also got really dark. But if you would like an apartment tour, let me know. I will try to take photos during the day.